Upland Cotton. Gossypium hirsutum L.
American upland cotton is the type most commonly cultivated in the South, from Virginia to Oklahoma and Texas, New Mexico, Arizona, and California, and this, with its hundred or more recognized horticultural varieties belongs to one species, namely, Gossypium hirsutum L., and not to G. herbaceum, as was at one time supposed. 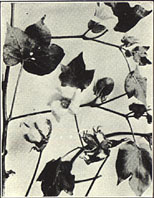 The cotton plant is found only in the South and Southwest, where it is so well known that a description of the plant is unnecessary. The bark of the root. The roots are taken up late in the fall but before frost, are washed, and the bark is removed with knives and dried. prev: Twinleaf. Jeffersonia diphylla (L.) Pers. next: Virginia Strawberry. Fragaria virginiana Duchesne.